It all began when my son gave me a Sirius satellite radio for my birthday. Let me tell you this is truly serious radio and it has been trouble with a big “T”. First off, forget the price of gasoline – I find any excuse to get in the car and drive around just so I can listen to the radio. For a person who gets car sick, this is a remarkable departure from my mode of operendi. My son set up all my favorite stations on auto punch so I could move seamlessly from 40s tunes to 50s and 60s. He also programmed an Elvis station, a health and fitness talk station, Fox news, CNN, show tunes, and as an afterthought – the Martha Stewart network. I’m not much of a Martha fan, but she does offer some good cooking programs. That’s where the trouble began. After chewing on a steady dose of 50s music, I decided to listen to something new, so I punched up Martha Stewart. Got tired of her fast, so I punched Elvis. Martha continued to talk. I tried the fitness channel and Martha still droned on. I later found out I had punched the buttons too hard and reset every station to Martha Stewart. So that’s all I listen to these days and it’s addictive. Earlier this week I caught her interview with a woman who is into grilling outdoors big-time. That interested me, so I went around the block five more times. It was a delightful show. She challenged women everywhere to leave the kitchen and experience the joys of cooking outside. She described how to “brine” your meat before putting it on the grill so it tastes like heaven and is fork tender. She suggested women go out and buy a big he-man grill and reclaim their rightful place at the barbeque grill. “Why should men have all the fun?,” she declared. I knew then and there I wanted to bridge the gender gap and become barbecue queen of my neighborhood..
One small problem – I don’t own a grill. The last one rusted from disuse and it looked ugly, so I gave it away. On line I found a honking’ big truck driver’s grill that had all the bells and whistles. It even had a smaller grill I could use when I was cooking for Rebel and Lucky. 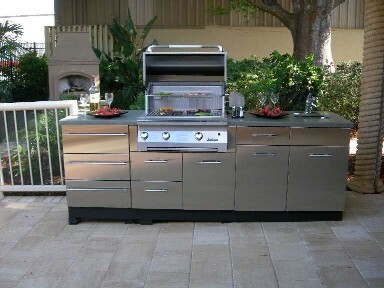 Unfortunately this monster grill had to be ordered and I couldn’t get it by Memorial Day. That was my target date for launching my new career as grill queen. So yesterday I drove to Columbus, (listening to Martha all the way) – she had a chef talking about how you could do an entire meal right down to the dessert on your outdoor grill. My mouth was watering and I envisioned my friends gathered around as I turned out platters of burgers, marinated pork tenderloins and skewered shrimp – all brined of course. Lowe’s in Columbus had a good substitute candidate – it was not the entire kitchen, but it had a rotisserie, two extra eyes for the corn and beans and drawers for my tongs and spatulas. It had more square footage than my guest room and it was a site to behold – shiny stainless steel. I rushed home and went on line to check out this product. I found a whole site dedicated to discussing grills. It turns out that “My Chosen” was made in China and one person said it rusted within two weeks and the handles fell off. Incidentally you’re supposed to take a magnet with you when you go grill shopping. If the magnet won’t stick, that’s a good thing (See, I’m even talking like Martha) That means it’s “fake” stainless steel. My hopes were dashed. Maybe I should go out and invest in a simple charcoal grill for $19.99 for my Memorial Day cookout and make absolutely certain I like grilling. Besides, men can do so little in the food preparation area, maybe grilling should remain their domain. Now I’m listening to the fitness station and preparing to go out and shop for some big manly barbells. I’ve not given up on grilling yet. But with a set of good triceps, I’ll look better standing at the grill. This entry was posted in General Stuff and tagged barbeque, grill, martha stewart, sirius, sirius radio, stainless steel by Emily Jones. Bookmark the permalink. I guess Braddock will have to reset your channels. What would you do without him? Please explain “brine” further.